I bet I am not the only one. I have too much jam in my fridge. I don't know what to do with it all. 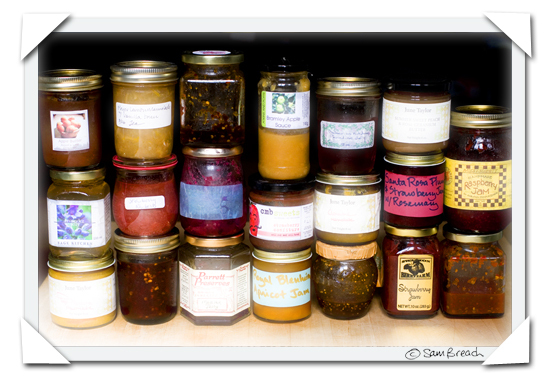 I would love to compile a list of 101 things you can do with jams, jellies, marmalades and preserves. Can anybody out there help me with suggestions? Sweet, savoury, cocktails, easy, intriguing, unusual, daring, anything-at-all-to-use-up-jam recipes. If you feel so inspired, please leave any ideas in the comments and in a couple of weeks I'll post the results with full credits (and links where applicable) to the authors of every idea. If your recipe idea is longer than a comment then post it on your own blog, let me know and I'll make a link to it when I prepare the ultimate list of things to do with jam. Example #1: Rub a piece of pork belly with salt and pepper and plenty of Chili Jam. Douse with a slug of Chipotle vodka and roast for just 30 minutes at 425F to crisp the edges then turn the oven down to 350F for another hour or so until the meat is cooked through. Example #2: Make a classic Victoria Sandwich. Example #3: Crown your favourite oozy melty cheese with a dab of jam you like, wrap in puff pastry, seal well and bake until golden. Serve hot - but remember jam can burn your tongue! Only 98 more to go, Thank you for any more ideas, Jam-I-Am! If you're the baking sort, heat it up 'til it's liquidy and brush it between cake layers or to glaze fruit on a tart. I've also used it as part of my ice cream base. My favorite use is peanut butter, jam, and bacon on toast. I see a couple of jellies in there but can't see the flavour. After cooking meat make a sauce for steak or pork. Deglaze pan with a little wine, then stir in a some of jelly, soy sauce and little worsestershire sauce. filling the well in thumbrpint cookies; filling for alfajores; spread on homemade english muffins; I've also read where you can use jam in making simple syrups. I've got the same problem...I'm making a Linzer Tart this weekend. Mix a spoonful into plain yogurt in the morning (especially good if chunky jam or marmalade). Jam makes a lovely glaze for a fruit tart. I've made plum tarts with apricot jam that turned out lovely. Lovely lovely lovely. I need me some new vocabulary. So simple but so good...My favourite is raspberry jelly with strong cheddar on a Jacob's cracker! My friend N turned me onto salt bagels with plain cream cheese and jam. mmmm salty sweetness. I also love love love making a sweet dijon vinagrette with a bit of cranberry or other relatively tart jam. Raspberry jam and cheddar cheese sandwiches... you'll have to find some proper cheddar though. However, the best use for jam, indeed if strawberry jam didn't exist this is what you'd invent it for, must be a cream tea! Eat it out of the jar! That many jars? Wow. How long have you had them for? Being the germaphobe that I am I'd toss some out(?!). How long does jam really last once the jar is opened. Ball park. WOW, I like this blog! Right now where I live, it's the harvest time and the forrests are full of berries. Will make marmelade next weekend! What a wonderful selection of jams, you could make jam tarts for your nephew. I'll go with option 3 as my fav! an impressive collecton of jam indeed! p.s. faith willinger was the cookbook author at Boulevard on Saturday - nice to bump into you...tried to post yesterday but i was in local computer shop and everything came up korean! Grape jelly is great to add to spaghetti sauce! jam cake rolls from Nikki's site. They are absolutely wonderful and will use up a whole lot of jam at once! I have used strawberry as well as mango jam, and I think any intensely sweet jam would work just as well. I like to melt down apricot jam and add in a little brandy. I then use it to baste roasted Cornish hens. You can use it for salad dressing. Whisk the jam into the vinegar until smooth. Then add oil. I like using apricot jam for this. Gives a nice touch of sweetness to a salad. You have chile jam? When I lived in SF I got a jar of Rojo jam from the Tierra chile lady at the Ferry farmer's market, along with some of her smoked red onions. I got some fresh chevre from Cowgirl inside the Ferry building, some eggs from the Marin Sun Farms stand, some of that purple german spinach, and a little Straus cream, and made omelets -- sauteed spinach and chevre inside, topped with a dollop of the jam and snipped smoked onion. They were a massive hit. a smear of jam on the bottom of a tart base. for example..for your basic chocolate ganache tart..blind baked pate sucre tart + smear of melted chocolate + a painting of jam + tart filling. A good way to get a lot of jam used up is to make a basic jam tart. I usually make a hearty pastry crust to hold up to the jam. Other ideas: Drop a spoonful in some Prosecco for a fruity cocktail; throw some into a blender with yogurt and soy milk for a smoothie delight; make sort of terrine with marscapone and jam and serve w/crackers; use it as the inside frosting on the layers of your favorite cake. OK Sam, I have to take issue - you are doing something wrong. As a fellow jam lover, it should not be possible to have so many open. You aren't eating enough toast. That's all there is to it. Maybe you should be put on a just jam and no butter for your toast diet until you measure up? I am at the opposite end of the spectrum. We've burned through so much jam that all I have left is lemon curd. Of course I have two teenagers to help me out. In fact, there is your solution - acquire a couple of teenagers until you have the problem under control! Seriously - I second the yogurt suggestion and I also like mixing spoons of jam into dressings. I often include jam in marinades and sauces. Anytime you come across adding sugar to something you are cooking for the next few weeks consider using jam to replace it and reduce a little liquid accordingly. Spoon a little jam over ANY roast you make right before you put it in the oven - do this as well as any other things you might do involving garlic, pepper, salt, etc. Hamentaschen. Cleans me out of jam every Purim. Why not make some BBQ sauce for chicken on the gril? What about mixing some - apricots, figs - into a lamb tagine? It may sound strange, but jam omelets are fantastic. I think they they are traditionally considered a desert and served with powdered sugar, but they make a great breakfast as well! I have the same problem--love buying jam, receiving jam and making jam, and am looking forward to some new ideas. If you haven't tried it yet, it's easy to invent a "sweet and sour sauce" with jam. Combine soy sauce, your favorite spice, a dash of cayenne, and a touch of sour--lemon juice, vinegar, etc. This slap-dash technique can also be used to create quickie chutneys by cooking the jam with sautéed or pickled veggies, tart or unripe fruit, chili sauce, ginger, cinnamon--virtually anything that offsets the sweetness. The key is to KEEP TASTING! Sam -- A sweet version of Russian vareneki has jam added to a cheese filling..... Crepes! !.....Homemade jelly doughnuts!....Cream cheese and jam sammies for tea...Pasta frolla with a glaze of apricot (or other) jam....Some dark jam (black currant?) used with prunes in a chicken Marbella-type dish....Jam melted and spiced up to use as a glaze on spareribs. Got to go see what I have in MY refrigerator. So many good ideas! Most of the ones I have thought of are already here - cake filling, thumbprint cookies, accompaniment for cheese (especially that fig jam I see in there), marinade or coating for roasted pork - the list goes on! Obtain good sized spoon from drawer. Dip into jar and fill with Jam. Insert spoon with jam in into mouth. I saw two wonderful uses of raspberry jam in the Basque Country recently. Top a baguette slice (crostini size) with a couple of thin slices of zucchini. Top that with a slice of aged goat cheese, from a round. top that with more zucchini slices. Top it with a wet but not too runny mixture of raspberry jam and raspberry vinegar. Top a baguette slice with a sun-dried tomato. Top that with a round of goat's cheese. Top that with raspberry preserves. Anchor with a toothpick. Looks good slightly off center, like the Museo Guggenheim! Crepes! Filled with jam and cream cheese, like I did this weekend ... or what about jam *in* muffins? Would that be weird? Put it on pizza ... jam, and mascarpone cheese, or maybe even the panir from cowgirl's. Bake the dough almost to completion, brushed with butter and sprinkled with a bit of sugar perhaps - not necessary when you're using jam, probably. Then spread jam, cheese on top, and two minutes in the oven. I had one many years ago in Italy with Nutella, but works wonders with jams as well. Thai appetizer: mix 1 teaspoon of thai green cury paste with 1/4 mango chutney, 1 T lime juice, and 1/4 cup mayo. Mix well. Pan fry some shrimp, cool, and chop into large 1/4" chunks. Mix with sauce. Spoon into won ton cups (made by baking won top wrappers in mini muffin pans to give cup shape) with a cilantro leaf on the top. Most any of the red jams, except strawberries, make good reductions for pork tenderloin. Shallots, butter, red wine, chicken stock, and jam. My favorites for this are plum and cherry. With a good steak, add a little gorgonzola over the top, and you're probably going to be pleased. Throw a crepe party!! Serve some sparkly with dollops of jam like clare suggested. You inspired me to write a post about jam! Mmm... I love jam! You can see my post at chewonthatblog.com here. I hope this helps! Thanks for putting me up to a challenge! Maybe you've already gotten this one? Heated in the microwave briefly and strained, apricot jam makes a delicious topping for fruit tarts - it seems to enhance the flavor of apple, pear or even berry tarts. Yummy stuff! Save it for the winter time when we have apples, pears, quinces and not a berry in sight! A dollop on (rice/tapioca/vanilla) pudding...or layered into a parfait with ice cream, amaretti/biscotti crumbles, and your wonderful jam. Oh my, that's a lot of jam. I was going to say make a simple jam tart (jam + eggs + tart shell, bake), but I think several people already beat me to it! wow! everyone - THANK YOU - I am going to have a field day making this post. ooh, i have another -- add spoonfuls to ganache when making truffles. I used some rhubarb-ginger jam to jazz up my seaweed rice rolls. Great for summer. Hi Sam - I noticed a bit of my apple butter there on your shelf. A great way to enjoy this is over some cottage cheese, btw. It's that classic cheese and apple combo. Makes a great breakfast. Take some green or yellow colored jam and heat it up. Add some gelatin to it, mix, and then pour half of it into a 9x9 pan. Let cool for a second and then sprinkle seabeans (aka samphire) over it. Then pour the rest of the jam/aspic mix over. Chillax it in the cooler until set. Next, take a small square cookie or biscuit cutter and cut out shapes from the set mold and then arrange on a platter. i'm checking every day - when you coming back? Rub apricot jam on roast pork loin, then re roast until crisp/caramelised a little. my partner just adored it! well, spice it up with some other ingredients...dare it. ginger etc? I once added wasabi. it was actually not bad!! I swear!